KRATER COMEDY CLUB: Until Nov 12, 7pm/8pm/10.30pm, £5-£36.50 Komedia, 44-47 Gardner Street, Brighton 0845 293 8480. NINA CONTI: £21, 7.30pm Brighton Dome (01273) 709709. With her much loved show, In Your Face. FRENCH: Meeting of Horsham French Club, 8pm, Roffey Millennium Hall. The subject for the evening will be ‘La Provence’. Refreshments provided. Info: www.horshamfrenchclub.org.uk. WALK: 2½ mile, flat, circular HDC Health walk along bridleways, country lanes and Downs Link. Meet 11am in the Country Park car park (off Cripplegate Lane), Southwater. Can be muddy. 1¼ hours. Dogs on a lead. Parking charge £1.50. Jill 07780 701184. CHAMBER MUSIC: £15, 7.45pm Cliffe Building, Sussex Downs College, Mountfield Road, Lewes. The Nicholas Yonge Society. The internationally acclaimed trio Con Brio Copenhagen, play Beethoven, Tchaikovsky and Sandstrom. Pre-concert talk at 6.30pm. Tickets at door or www.nyslewes.org.uk. 8-25yrs free. WOLF HALL LIVE: 7.30pm, £24, The Capitol, Horsham, 01403 750220, www.thecapitolhorsham.com. ISLANDS IN THE STREAM: From £29, 7.30pm Theatre Royal, Brighton 0844 871 7650. The music of Kenny Rogers and Dolly Parton. JON BODEN SOLO: £21.50, 8pm Connaught Theatre, Union Place, Worthing 01903 206206. Afterglow album launch tour. LET’S GET FUNKED: £8, 7.30pm all Saints Centre, Friars Walk, Lewes. Funk, soul and reggae music for grown ups who like to party. MANBITESDOG: The Swan, Crawley, 9pm. NATHASSIA: £5, 7pm Komedia, 44-47 Gardner Street, Brighton 0845 293 8480. Feel The Future Now Tour. RUBY AND THE REVELATORS: Free, 8pm Lewes Con Club, 139 High Street, Lewes 01273 473076. SMALL TOWN KIDS: Ashington Social Club, Publborough, 8pm. THE FB POCKET ORCHESTRA: Cranleigh Arts Centre, Cranleigh, 8pm. THINK FLOYD: £22.50, 7.30pm Assembly Hall Theatre, Tunbridge Wells (01892) 530613. Tribute band. 100 MONKEYS: Railway Inn, Billingshurst, 8.30pm. ANNA CHRISTIE: £7-£8, 745pm until Nov 18 (Sun 2.30pm) New Venture Theatre, Bedford Place, Brighton 01273 746118. A play by Eugene O’Neill. MEET THE AUTHOR: £5, 7.30pm Under Ground Theatre, Grove Road, Eastbourne 0845 680 1926. Featuring three local authors. ONCE UPON A TIME: £14-£16, 7pm White Rock Theatre, Hastings (01424) 462288. Storytelling through circus movement and dance. RUBY WAX: £20, 8pm The Royal Hippodrome, Eastbourne (01323) 802020. A Mindfulness Guide for the Frazzled. THE RED ROOM: £17-£18, 7.30pm Trinity Theatre, Tunbridge Wells (01892) 678678. Based on the classic ghost story by H G Wells. GARY DELANEY: £17-£18, 8pm Trinity Theatre, Tunbridge Wells (01892) 678678. There’s Something About Gary. ALTER EGO: The Bedford, Horsham, 9pm. CRAFT AND GIFT FAIR: 10am-3pm, Barns Green Village Hall. Sussex stallholders selling home made craft items and seasonal gifts. Fund raising event for projects at St Nicolas Church, Itchingfield, who will be organizing a bric-a-brac and household stall. Entry is free and there is a car park. Light refreshments available. All ages catered for at this relaxed and sociable event. Contact briarlodge.ian1@gmail.com. FALMER CHRISTMAS MARKET: November 11/12, 10am-4pm Falmer Village Hall. Cards, prints, ceramics, knits, jewellery, bird boxes, decorations plus cafe and much more. HORSHAM ROCKS PRESENTS: Trevor Clawson, The Carfax Bandstand, Horsham, 1pm-3pm. MID SUSSEX RAMBLERS: Woods, Commons and Fields of Chailey, 6 miles with Ian R (07594 549552 on day). Meet at North Chailey Sports Club car park, 10am. WALK: Meet and park 10.30am, opposite the Barn at Sumners Ponds, Barns Green, RH13 0PR. A lovely 4-mile HDC Health walk, around a working farm, some gates and stiles. Can be muddy. No dogs. 2 hours. Douglas 01403 268807 or Pauline 01403 240419. BEYOND THE BARRICADE: 7.30pm, £22.50, The Capitol, Horsham, 01403 750220, www.thecapitolhorsham.com. MUSICIANS OF ALL SAINTS: £9-£12, 7.45pm St Michael’s Church, High Street, Lewes. BLACK STRAP MOLASSES: Free, 10am-noon at the regular coffee morning, Under Ground Theatre, Grove Road, Eastbourne 0845 680 1926. BRIAN POOLE AND THE TREMELOES: £25.50, 7.30pm The Royal Hippodrome, Eastbourne (01323) 802020. COLLABRO: £19.50-£99, 7pm De la Warr Pavilion, Bexhill (01424) 229111. Plus special guests. HOT CLUB OF COWTOWN: £20, 7.45pm The Hawth Theatre, Crawley (01293) 553636. Americana Night. JOE BROWN: £25.50-£29.50, 7.30pm Pavilion Theatre, Marine Parade, Worthing 01903 206206. The first nationwide tour ever. LEWES SATURDAY FOLK CLUB: £10, 8pm Elephant and Castle, Lewes. Niamh Parsons and Graham Dunne. MUSA MBOOB: £5, 8pm Lewes Con Club, 139 High Street, Lewes 01273 473076. With Joko. SUSSEX CHORUS: Remembrance Saturday, 7.30pm, The King’s Church, Burgess Hill. Works by Elgar and John Ireland. Tickets £15, £5 for students and under 16s. Available from Sussex Chorus 01444 412579, WeGotTickets.com, Carousel Music 01444 417654, Burgess Hill Help Point 01444 247726. THE SUMMER OF LOVE: £17.50-£18.50, 7.30pm Chequer Mead, East Grinstead (01342) 302000. 50th Anniversary Concert. WHITNEY – QUEEN OF THE NIGHT: From £22.90, 7.30pm Theatre Royal, Brighton 0844 871 7650. BENJAMIN ZEPHANIAH: £23, 7.30pm White Rock Theatre, Hastings (01424) 462288. And The Revolutionary Minds. TALES IN MUSIC: £5, 11.15am Komedia, 44-47 Gardner Street, Brighton 0845 293 8480. The Pigeon and The Albatross. Suitable for 5-11yrs. COMEDIANS CINEMA CLUB: £5, 8pm Komedia, 44-47 Gardner Street, Brighton 0845 293 8480. Improvised versions of movies. BEACHY HEAD RAMBLERS: Armistice Sunday at the Airman’s Grave, 10 miles with Sue D 07803 086840. Meet at Kings Standing car park on B2026 in Ashdown Forest, 10am. BEDELANDS FARM NATURE RESERVE: 10am-2pm. Meet in car park off Maple Drive. Friends of Burgess Hill Green Circle Network. Bi-monthly work parties, no experience needed, tools provided. Mary Smith (secretary) 01444 242667. MID SUSSEX RAMBLERS: Remembrance Day Walk, Ashdown Forest, 6 miles with Tony 01444 473778. Meet at Millbrook East car park, 9.30am. BRIGHTON PHILHARMONIC ORCHESTRA: £12-£38, 2.45pm Brighton Dome (01273) 709709. Barry Wordsworth conductor, Matthew Trusler violin. RTW CHORAL SOCIETY: £10, 3pm Assembly Hall Theatre, Tunbridge Wells (01892) 530613. Dvorak and Brahms. AFRO CELT SOUND SYSTEM: £25, 7.30pm De la Warr Pavilion, Bexhill (01424) 229111. Plus The Dhol Foundation. SOMEONE LIKE YOU: 320-£22, 7.30pm The Hawth Theatre, Crawley (01293) 553636. The Adele Songbook. TERRY LEES AND MIKE ROSS: £5, 7pm Under Ground Theatre, Grove Road, Eastbourne 0845 680 1926. Blues Night. HANSEL AND GRETEL £8, 2.30pm Trinity Theatre, Tunbridge Wells (01892) 678678. OF HOPE AND ENDURANCE: £8, 7pm Under Ground Theatre, Grove Road, Eastbourne 0845 680 1926. The Legacy of Etty Hillesum. PROFUSION: £8.50, 2pm Chequer Mead, East Grinstead (01342) 302000. This is a youth production. SING-A-LONG: From £15 Theatre Royal, Brighton 0844 871 7650. Sing-a-long-a-Frozen, 2pm; Sing-a-Long-a Sound of Music, 7pm. THE ALPHABET OF DANCE: £11, 4.30pm The Royal Hippodrome, Eastbourne (01323) 802020. Bond School of Dance Seaford presentation. FERN BRADY: Suffer Fools. £8-£10, 8pm Komedia, 44-47 Gardner Street, Brighton 0845 293 8480. Evening of mediumship: With medium Sandra Clarke, 7.30pm, with refreshments and raffle, £5, Barnham Community Hall, Murrels Field, Yapton Road, Barnham. Yapton and Barnham SNU Spiritualist Pioneer Centre. LEWES HISTORY GROUP: Lewes Within Living Memory by Bob Cairns, 7pm King’s Church, Brooks Road, Lewes. £2 members, £3 non-members. SUSSEX FAMILY HISTORY GROUP: Family Search by Elder P V Tanner, 7.30pm Bridge Cottage, High Street, Uckfield. WALK: Meet 10am at the Owl Public House, Kingsfold, RH12 3SA. New, mainly flat, 5 mile HDC Health walk with some stiles, on the Sussex Border Path via Friday Street. May be muddy. No dogs please. 2 hours. Graham 01403 733677. WALK: Meet 10.30am, Hop Oast Park and Ride, Horsham, Worthing Road, RH13 0AR. A gentle 2-mile HDC Health walk. Bus 23 and 98 from Horsham takes you to the Park and Ride. Walking one of several routes in Denne Park/Chesworth to Horsham. No dogs. 1 hour. Jill 07780 701184 or Jean 07734 323321. BLUE ROSE CODE: £10, 7pm Latest MusicBar, 14-17 Manchester Street, Brighton (01273) 687171. FLASHDANCE – THE MUSICAL: From £15, 7.30pm until Nov 18 (Wed/Sat mat 2.30pm) Assembly Hall Theatre, Tunbridge Wells (01892) 530613. JON RONSON: £21, 7.30pm Brighton Dome (01273) 709709. Jon Ronson’s Psychopath Night. JIMMY CARR: £30, 8pm The Hawth Theatre, Crawley (01293) 553636. The Best Of, Ultimate, Gold, greatest Hits Tour. MID SUSSEX RAMBLERS: Lindfield to Horsted Keynes, 9 miles with Yvonne 01444 441926. Meet at Hickmns Lane car park, Lindfield, 10am. SEAFORD LECTURE AND LITERARY CLUB: Popular Artists and Songs From the Early Years of Recording by Dave Homewood, 7.30pm St Leonard’s Church Hall, Seaford. The Lewes Literary Society: All Saints Centre, Friars Walk, Lewes, 8pm. Talk by Emma Tucker, The Future of Print Journalism. Visit www.lewesliteraryscoiety.co.uk. 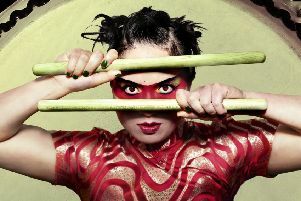 NU CIVILISATION ORCHESTRA: £15, 7pm Brighton Dome (01273) 709709. The Jazz Ticket. JULIUS CAESAR: £10-£12, 7.45pm The Hawth Theatre, Crawley (01293) 553636. Pitchy Breath Theatre Company. THE HUNTING OF THE SNARK: £14.50, 1.30pm/5pm Devonshire Park Theatre, Eastbourne (01323) 412000. Suitable for ages 4yrs plus. THE KITE RUNNER: From £14, 7.45pm until Nov 18 (Wed/Thurs/Sat mat 2.30pm) Theatre Royal, Brighton 0844 871 7650. THE WITCHES OF EASTWICK (HAODS). Tuesday to Saturday, November 14-18, £17.50-£19.50, 7.30pm (Saturday 2pm and 7pm), The Capitol, Horsham, 01403 750220, www.thecapitolhorsham.com. ED BYRNE: Spoiler Alert. £25.50, 8pm Pavilion Theatre, Marine Parade, Worthing 01903 206206. ED GAMBLE: Mammoth. £12, 8pm Komedia, 44-47 Gardner Street, Brighton 0845 293 8480. BEACHY HEAD RAMBLERS: The Tranquil Reservoir, 10 miles with Marilyn and Malcolm N 07801 299107. Meet at Arlington Reservoir car park, 10am. LEWES FOOTPATHS GROUP: Greenway near Sidley, 5 miles with Robert 474357. Meet at North Street car park, Lewes, 9.30am. MID SUSSEX RAMBLERS: AGM at 8pm in the Upper Room, Town Hall, 40 Boltro Road, Haywards Heath. TALK: Building on Brighton’s Open Fields, c1770-1850 by author and historian Dr Sue Berry, 2.30pm The Keep, Falmer. £3. WALK: A 4½ mile HDC Health walks with gentle undulating terrain. We may encounter animals. Meet 10.45am, Hazel Way/Cob Close junction, Crawley Down, RH10 4EX. 2 hours. Pat 01342 712591. HAPPY MONDAYS: £32, 7pm Brighton Dome (01273) 709709. 30th Anniversary Twenty Four Hour Party – Greatest Hits Tour. LIZA SINGS STREISAND: £20, 7.30pm Chequer Mead, East Grinstead (01342) 302000. Liza Pulman. MIDGE URE: £28-£33, 7.30pm Devonshire Park Theatre, Eastbourne (01323) 412000. Midge Ure, The Christians, Altered Images together in concert. OMD: £35, 7pm De la Warr Pavilion, Bexhill (01424) 229111. The Punishment of Luxury Tour. THE SENSATIONAL 60’S EXPERIENCE: £29.50, 7.30pm The Hawth Theatre, Crawley (01293) 553636. Mike Pender, Chris Farlowe, Herman’s Hermits, The Fortunes, The New Amen Corner. ROB BRYDON: £31, 8pm Devonshire Park Theatre, Eastbourne (01323) 412000. I Am Standing Up. THE NOISE NEXT DOOR: Uproar. £17-£18, 8pm Trinity Theatre, Tunbridge Wells (01892) 678678. HAYWARDS HEATH CERAMIC GROUP: Annual Discovery Day lecture with Will Farmer, from the BBC Antiques Roadshow. Will will be talking this time on ‘René Lalique – From Gold to Glass. A two-part lecture following Lalique’s fascinating career over the years, with one part before lunch and one after lunch. The lectures will take place in the Studio at Clair Hall, commencing at 10.30am. Coffee served from 10am until 10.20am. A two-course buffet lunch will be provided with tea or coffee. Non-members are welcome by prior arrangement with the membership secretary (01444 483372 or 01444 483599), tickets £40 including lunch. POLEGATE RAMBLERS: Leisurely walk, Peelings Lane to Pevensey, 2.25 miles with Sue and Derek 482441. Meet at Medical Centre for bus 56 at 10.17am to Stone Cross. Water, Fields and Woods, 5 miles with Carol 484152. Or, A Walk on the Downs, 9.5 miles with Aled 484723 (picnic lunch). Meet at Wannock Road Recreation Ground, 9.30am. CHRIS WOOD: 315, 7.30pm Komedia, 44-47 Gardner Street, Brighton 0845 293 8480. English folk. THE ICICLE WORKS: £17.50, 7.30pm Komedia, 44-47 Gardner Street, Brighton 0845 293 8480. The music of Ian McNabb and The Icicle Works. THE SENSATIONAL 60’S EXPERIENCE: £29.50, 7.30pm White Rock Theatre, Hastings (01424) 462288. Mike Pender, Chris Farlowe, Herman’s Hermits, The Fortunes, The New Amen Corner. CACKLE ‘N’ TWANG: £9, 7.30pm Latest MusicBar, 14-17 Manchester Street, Brighton (01273) 687171. Music and comedy charity fundraiser. CHARGE: £17.50-£19.50, 7.30pm and Nov 17, Connaught Theatre, Union Place, Worthing 01903 206206. Dance Company Motionhouse Production. MAKING MANKIND: £5, 8pm Latest MusicBar, 14-17 Manchester Street, Brighton (01273) 687171. An evening of poetry and rap. Duke Of York’s (0871 902 5728): Three Billboards Outside Ebbing, Missouri (15) Fri 6.30. Battle of The Sexes (12A) Sat 6.30. Kid’s Club: The Ant Bully (U) Sat 10.30. Film Stars Don’t Die In Liverpool (15) Sun 9.00. Wonderstruck (PG) Sun 2.00. The Red Shoes (U) Sun 6.15. Autism Friendly Screening: The Ant Bully (U) Sun 10.30. 120 Beats Per Minute (18) Mon 6.30. The Enchanted Screen: Labyrinth (U) Mon 9.00. Happy End (15) Tue 6.30. Loveless (15) Wed 6.30. Tag (18) Thu 10.00. NT Live: Follies (12A) Thu 7.00. Orion (01444 243300): Paddington 2 (PG) Fri & Mon-Thu 5.00, 7.45; Sat & Sun 12.00, 2.45, 5.35, 8.15. Murder On The Orient Express (12A) Fri & Mon-Wed 5.20, 8.10; Sat & Sun 2.00, 5.00, 7.45; Thu 4.00; Golden Years Show: Wed 2.00. Live By Satellite: NT Live: Follies (12A) Thu 7.00. New Park (01243 786650): The Mountain Between Us (12A) Fri 1.15; Sat 8.45; Sun 2.45; Wed 9.00. Breathe (12A) Fri & Sat 3.45; Sun 8.15; Mon 4.15; Tue 8.45; Wed 1.15; Thu 12.00. Marie Curie: The Courage Of Knowledge (15) Fri 6.15. Talk: Dustin At 80 (PG) Fri 6.30. The Glass Castle (12A) Fri 8.45; Thu 4.30. A Bag Of Marbles (12A) Sat 1.15. The Teacher (12A) Sat 6.15. Lost In Paris (12A) Sun 12.45; Mon 8.45. Indochine (15) Sun 5.15; Mon 1.15. A Woman’s Life (15) Tue 1.15. Corporate (15) Tue 6.15. School Of Life (PG) Wed 3.45. Manifesto (15) Wed 6.30. The Paris Opera (PG) Thu 2.15. Follies (12A) Thu 7.00. Arts Centre (01483 278000): The Zookeeper’s Wife (12A) Wed 7.30. National Theatre Live: Follies (12A) Thu 7.00. Curzon (01323 731441): Paddington 2 (PG) Fri & Mon-Thu 2.00, 5.00, 8.05; Sat & Sun 1.45, 3.50, 6.00, 8.05. Breathe (12A) 2.05 (not Wed); 5.05; 8.00 (not Wed). Murder On The Orient Express (12A) 2.15, 5.10, 8.10. Eastbourne Film Society: The Edge Of Seventeen (15) Wed 2.00, 8.00. Scott Cinemas – The Atrium Cinema (01342 321666): Thor: Ragnarok (12A) Sat & Sun 3.20. Murder On The Orient Express (12A) Fri & Mon-Thu 2.30, 5.10, 8.30; Sat & Sun 5.10, 8.10. A Bad Moms Christmas (15) Fri & Mon-Wed 3.50, 6.10; Sat, Sun & Mon 6.10. Paddington 2 (PG) Fri & Mon-Wed 2.50, 5.25, 8.00; Sat 11.00, 12.15, 1.30, 2.50, 5.25, 8.00; Sun 11.00, 12.25, 1.30, 5.25, 8.00; Thu 2.00, 4.30, 7.45. The Death Of Stalin (15) 8.30. Kids’ Crew: Despicable Me 3 (U) Sat 10.10. Kids’ Crew: The Nut Job 2: Nutty By Nature (U) Sat 10.10. The Lego Ninjago Movie (U) Sat 1.00; Sun 10.10, 1.00. Bolshoi Ballet: The Taming Of The Shrew (12A) Sun 3.00. Silver Screen: Viceroy’s House (12A) Wed 10.30. National Theatre Live: Follies (12A) Thu 7.00. Pavilion (01323 841414): Blade Runner 2049 (15) Fri & Mon 7.45; Sat & Sun 2.15, 7.45. Victoria And Abdul (PG) Wed 2.15, 7.45; Thu 2.15. NT Live: Follies (12A) Thu 7.00. Clair Hall (01444 455440): Churchill (PG) Wed 5.30, 8.00. The Capitol (01403 750220): Murder On The Orient Express (12A) Fri 2.15, 5.15, 7.45; Sat 2.15, 5.15, 7.45; Sun 5.15, 7.45; Mon 2.15, 5.15; Tue & Wed 2.15, 5.15, 7.45; Thu 12.45, 3.45. Paddington 2 (PG) Fri, Sat, Tue, Wed & Thu 1.45, 4.45, 7.15; Sun 4.45, 7.15; Mon 1.45, 4.45. Blue Oasis Film Club: Paddington (PG) Sat 11.00. World Kindness Day Charity Preview Screening: Wonder (PG) Mon 7.15. Horsham Film Society: The Salesman (PG) Mon 8.00. Box Office Babies Screening: Paddington 2 (PG) Tue 10.30. NT Live: Follies (12A) Thu 7.00. Depot (01273 525354) (lewesdepot.org): Paddington 2 (PG) Fri 3.45, 6.00, 8.15; Sat 11.00, 1.15, 3.45, 6.00; Sun, Wed & Thu 1.30, 3.45, 6.00; Mon 3.45, 6.00, 8.15; Tue 12.00, 3.45, 6.00, 8.15. The Killing Of A Sacred Deer (15) Fri & Mon 5.30, 8.00; Sat 2.30, 8.00; Sun 3.30, 8.00; Tue 3.15, 8.15; Wed 5.30, 7.45; Thu 4.15, 8.15. Unrest (12A) Fri 3.15, 5.45; Sat 12.30, 2.45, 5.00, 7.15; Sun 1.15, 5.45; Mon 1.45, 4.00; Tue 1.15, 3.30, 5.45; Wed 2.45; Thu 2.00, 3.30. The Ballad Of Shirley Collins (12A) Sat 5.30; Sun 3.30, 8.15; Mon 3.30, 6.15; Tue 1.30, 6.00; Wed 3.30, 8.15; Thu 5.45. Thelma (15) Fri 3.00, 8.00; Sat & Mon 8.15; Sun & Thu 8.00; Tue 8.30; Wed 5.15. The Cinema Travellers (PG) Sun 6.00. NT Live: Follies (12A) Thu 7.00. Speed Sisters (PG) Wed 8.00. Windmill Cinema (01903 715920): Murder On The Orient Express (12A) Fri 3.45, 8.35; Sat 3.45, 6.10; Sun 2.45, 5.10; Mon 6.10, 8.35; Mon & Wed 3.45; Tue 2.45; Thu 11.00. The Mountain Between Us (12A) Fri 6.10; Sat 8.35; Sun 7.35; Mon 3.45. Seaford Community Cinema, Barn Theatre (www.seafordcinema.org): NT Live: Follies (12A) Thu 7.00. The Picture House (01825 764909): Cream Tea Classic: The Adventures Of Robin Hood (U) Wed 2.00. Paddington 2 (PG) Fri & Mon-Wed 11.30, 2.00, 4.10, 6.20, 8.30; Sat 11.15, 11.30, 1.30, 1.45, 2.00, 3.45, 6.10, 6.20, 8.30; Sun 10.45, 11.30, 1.20, 2.00, 3.30, 4.10, 6.20, 8.30; Thu 2.0, 4.10, 6.20, 8.30; Parent & Baby Screening: Thu 11.30. Murder On The Orient Express (12A) Fri & Tue 11.00, 2.10, 3.50, 6.00, 6.10, 8.20, 8.40; Sat 3.55, 6.00, 6.15, 8.20, 8.40; Sun 11.00, 1.00, 5.40, 6.30, 8.45; Mon 11.00, 2.10, 5.30, 6.00, 8.20; Wed 11.00, 1.30, 3.50, 6.00, 6.10, 8.20, 8.40; Thu 1.45, 3.50, 4.10; Parent & Baby Screening: Thu 11.00. Breathe (12A) Fri 11.15, 1.25; Mon 2.20; Tue & Thu 1.25; Parent & Baby Screening: Thu 11.15. Saturday Morning Movie: Captain Underpants (U) Sat 10.30. Bolshoi Ballet: The Taming Of The Shrew (tbc) Sun 4.00. National Theatre Live: Follies (12A) Thu 7.00. Dome (01903 823112): Autistic Screening: Paddington 2 (PG) Sat 10.15. Justice League (12A) Thu/Fri (midnight) 12.01. Murder On The Orient Express (12A) Fri 11.45, 2.30, 5.15, 8.00; Sat 12.10, 5.30, 8.15; Sun 3.05, 5.45, 8.25; Mon 11.45, 2.30, 8.00; Tue & Wed 11.45, 2.30, 5.15, 8.00; Thu 12.15, 3.00, 5.45, 8.25. My Little Pony: The Movie (U) Sun 10.15. Paddington 2 (PG) Fri 11.00, 1.20, 3.40, 6.10, 8.40; Sat & Sun 10.00, 12.40, 3.30, 6.10, 8.40; Mon 11.00, 1.15, 3.35, 6.05, 8.40; Tue & Wed 11.00, 1.15, 3.30, 6.00, 8.30; Thu 11.00, 1.20, 3.40, 6.05, 8.30. Thor: Ragnarok (12A) Sat 2.40; Sun 12.20. Connaught (01903 206206): Murder On The Orient Express (12A) Fri 12.30; Sat & Sun 12.30, 3.10, 5.45, 8.00; Mon 12.30, 3.10, 5.45, 8.30; Tue 1.00, 3.10, 5.45, 8.30; Wed 1.20, 5.45, 8.40; Thu 12.15, 2.45. Paddington 2 (PG) Fri 12.00, 3.15, 5.45, 8.00; Sat 10.00, 12.45, 3.00, 5.30, 8.15; Sun 10.15, 10.45, 1.00, 3.15, 5.30, 8.15; Mon 1.30, 4.00, 6.15, 8.15; Tue 12.45, 3.45, 6.10, 8.15; Wed 11.00, 4.15, 6.30, 8.15; Thu 11.45, 2.00, 4.15. Saturday Morning Pictures: The Jungle Bunch (U) Sat 10.15. Silver Screen: Murder On The Orient Express (12A) Mon 11.00. National Theatre: Follies (12A) Thu 7.00.